Photos of the 14-year-old girl who was allegedly abducted and raped severally by a police corporal in Onitsha, Anambra State, has surfaced online.. The suspect identified as Corporal Garba Barau, who is originally serving under Mopol 7, Sokoto was posted on a special assignment to Anambra State, where he abducted the 14-year old girl, kept her under his custody and raped her several times for a period of six days. 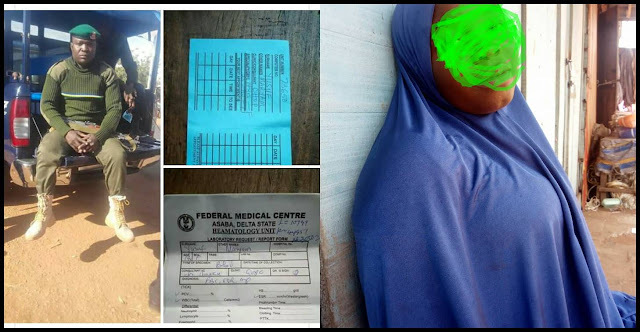 The victim identified as Maryam Yusuf reportedly got stranded in Onitsha, after losing her transport fare to Asaba, Delta state capital, where her parents are based. She was said to have been approached by Garba who was attached to the Okpoko police divisional headquarters on special duty. The policeman was said to have deceived the teenage girl as he took her to the police barracks, where he lives. The girl was raped throughout the period she stayed with the suspect until her v@gina ruptured, according to Hassan Haruna Dambatta. According to reports, the young girl got hold of Corporal Barau Garba phone and called his father who then raise alarm. A Man Hang Himself To Death In Ibadan, Oyo State.